the show will be well received. Different styles of work demand diverse staging, but there does seem to be basic conventions each of us adhere to when searching for just the right look. These conventions can be traced back to the formal Elements of Art and Design with your emphasis on keeping the pottery the top priority. the picture in Fig. A. When a group of pieces relatively the same size are arranged together on a tabletop even if there is a slight difference in height and grouping, they produce a static line which the viewer more than likely perceives as uninteresting. In Fig. B, when the same pieces are arranged at angles and varying heights, the line becomes much more engaging and attractive to the brain. Space, is also important for that dynamic line. A successful use of space can make the difference between an overcrowded exhibit versus one that allows each piece to shine. 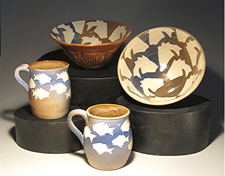 Each piece of your pottery is extraordinary. But, with improper spacing, the uniqueness of each piece gets lost. Your exhibit becomes a sea of forgettable pottery. Instead, carefully orchestrate resting places for the viewer’s eyes to be able to stop and focus by creating open spaces on the table. To do this, you may need to make a choice to store some of the pottery until later in the show in order to create a pleasing arrangement that shows off your hard work. In doing so, you form a showcase for the pieces left on the table. Not only that, but as the show progresses and you reveal stored pieces, you reinvent your display and viewers will want to come back for a second look.